The Whitmire Wildflower Garden is a place for year-round walking and for appreciating and learning about nature and natural landscaping. 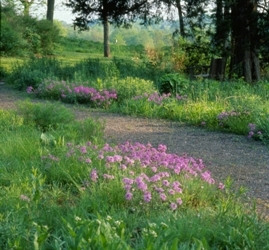 Garden paths take you through five plant community areas (woodland, wetland, glade, savanna and prairie) and a home gardening area which includes a native perennial garden, rock garden, prairie garden, water garden, woodland garden and rain garden. 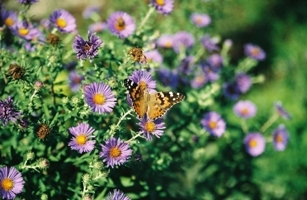 Over 800 Missouri native plant species are on display. 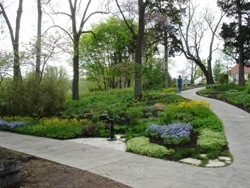 The Whitmire Wildflower Garden is located next to the Bascom House. Picking or digging wildflowers is strictly prohibited. Please, no smoking or pets. Visitors, including photographers, must remain on paths. 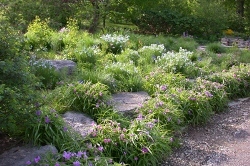 This area includes a native perennial garden, rock garden, prairie garden, water garden, woodland garden, rain garden, patio garden and ground cover garden. The plants in these garden demonstrations are native to Missouri and are useful for home gardening and small outdoor school classrooms. They are available from local nurseries and mail-order catalogs. Native plants are excellent, low-maintenance choices for home gardening because they are adapted to local conditions. They also provide habitat and food for hundreds of species of native insects, birds and mammals. Some of the most popular gardening perennials are native to Missouri including garden phlox (Phlox paniculata), purple coneflower (Echinacea purpurea), blue wild indigo (Baptisia australis), and blue-flag iris (Iris virginica). They have showy blooms, are disease resistant, are hardy, and are long-lived perennials in Missouri. This small garden is essentially a pile of crushed limestone and boulders with a small amount of organic matter and clay mixed in. The plants growing here come from natural limestone glades, rocky dry areas with shallow soil and few trees. Water gardens are excellent places to attract a wide variety of aquatic insects, dragonflies, frogs, salamanders, and birds. This small water garden is simply constructed with a rubber liner and flat rocks around the edge to hold the liner in place. A small solar-powered pump at the bottom circulates water into a “birdbath” boulder to the rear. Though many woodland wildflowers bloom in spring, there are a number that bloom in summer and fall and grow in wet or dry soils. Among them are skullcap (Scutellaria incana), purple coneflower (Echinacea purpurea), yellow wingstem (Verbesina helianthoides), and several species of late-summer blooming asters and goldenrods. This prairie garden has several features that make it appropriate for home landscapes. Prairie dropseed grass (Sporobolus heterolopis) is planted as a groundcover at the edge of a walking path with a split-rail fence between it and the prairie plants creating a clean transition. Unlike typical lawns, prairie landscapes need mowing only once a year and they provide excellent habitat for wildlife. Native Missouri groundcovers are showcased between the home landscaping shelter and the patio garden. This area gives the home landscaper alternatives to traditional non-native, and often invasive, groundcovers. Native suckering sedges will also have an important place in the groundcover garden in addition some taller species. Rain gardens function like miniature natural watersheds. They slow down, capture and absorb water rather than let it quickly run away, causing erosion. This design was created based on the original topography to collect rain water from nearby buildings and provide a beautiful setting for an outdoor patio. The patio garden is located next to the carriage house providing a beautiful outdoor classroom and meeting area. Species used around the patio are drought tolerant so as to need a minimum amount of watering. Several container gardens are also displayed on the patio showcasing a variety of beautiful arrangements. Between the patio and rain garden a variety of sedges grow on the hillside. One of the original buildings on the site, the Bascom House, built in 1879, was restored in 1996. Mature white, post and chinquapin oaks are the dominant tree species in this open woodland. Beneath these trees mowed lawn has been killed and replanted with native upland shade-loving species. During the first two years of establishment, these areas are weeded, mulched and watered similarly to any other garden but by year three very little weeding and watering is needed. Limestone Glades are outcroppings of limestone on hot, sunny slopes and are common throughout the Ozarks. Many showy plants like Indian paintbrush (Castilleja coccinea), pale purple coneflower (Echinacea pallida), and blue wild indigo (Baptisia australis) are tolerant of these harsh conditions and are growing here. Shortleaf pine is native throughout the Ozark Region in Missouri and as far north as the La Barque Hills area of Eureka, Missouri. It typically is associated with sandstone outcrops and various acid-loving plants like blueberries, mountain azalea, and legumes like leadplant (Amorpha canescens), goats rue (Tephrosia virginiana), and cream wild indigo (Baptisia bracteata). This area in the wildflower garden is a demonstration of a spring-fed pool. It is planted at the edges with many wet-loving plants like royal fern (Osmunda regalis) and sensitive fern (Onoclea sensibilus), several sedge species (Carex spp. ), cardinal flower (Lobelia cardinalis), soft rush (Juncus effusus), and pickerel weed (Pontederia cordata). Water lilies (Nymphaea odorata) are planted in containers which sit on the floor of this concrete pool. Sedge Meadows occur naturally in wet prairies, spring areas and river flood plains. They support a rich array of plants like queen-of-the-prairie (Filipendula rubra), turtlehead (Chelone obliqua), blue-flag iris (Iris virginica) and about 140 species of sedges (Carex) in Missouri, some of which are growing in this area. Though we do not know the history of this persimmon grove, it appears to be planted with several varieties of native persimmon. Some varieties bear large fruits and some are small. Some ripen in early September, some in October, and even one that ripens in late November. The fruits are edible raw or cooked and are often used in muffin, pancake, and bread recipes. A variety of grasses, including big bluestem, switch and Indian grass, and forbs (prairie wildflowers) like coneflowers and compass plant are typical of prairies and are in peak display in July and August. Tallgrass prairie once covered millions of square miles and comprised about 40% of Missouri. The prairie area here is about 10 acres and is managed by fire during winter. 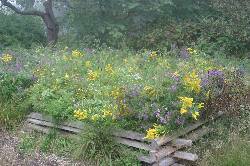 More info about creating your own prairie garden is available in our Native Landscaping Manual. Woodland wildflowers bloom mostly in early spring before trees leaf out. At that time of year you will see masses of Virginia bluebells (Mertensia virginica), wood poppies (Stylophorum diphyllum), bloodroot (Sanguinaria canadensis), wild geranium (Geranium maculatum), ferns and many other beautiful woodland plants. This small constructed wetland was a cattle pond in the early 1900’s. 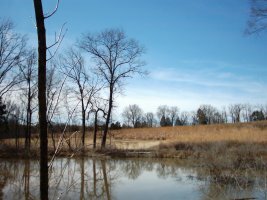 In 2002 it was enlarged, repaired, and seeded with a diverse selection of wetland plants. It has several species of sedge, rush, and bulrush, and also rosemallow (Hibiscus), autumn sneezeweed (Helenium autumnale), swamp milkweed (Asclepias incarnata), and false aster (Boltonia asteroides) to name a few. This area is home to a host of dragonflies, frogs, salamanders, and birds. 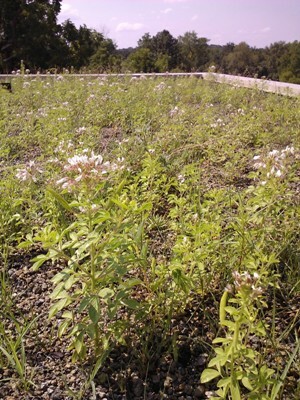 In spring of 2012 Shaw Nature Reserve built a green rooftop on top of its new bathroom near the picnic pavilions. First, the building was engineered to support the extra weight! You can’t just put a green roof on top of any building. The next step involved rolling out a protective layer of rubber liner. Then inter-locking rigid plastic trays were spread out over the entire area followed by a sixinch layer of soil that was hoisted onto the roof with a crane. The soil is a lightweight mixture of heat-expanded rock, compost and sand. In early May seed was hand sown. Seed had been kept cool and moist in a refrigerator for over two months to break seed dormancy. Germination occurred within one week followed by a light fertilizing three weeks later. PARTS USED: Bulbs, Leaves. Gather the whole plant like scallions, before the flower stalk appears (May-June). Remove the tough outer layers and use only the tender, inner parts. Boil these for 1/2hour in water salted to taste. Serve hot with butter or add to any dish. PARTS USED: Fruit, leaves. Fruits ripen June through August They are dark purple, sweet, and juicy. Fruit can be eaten raw, cooked, or dried. The leaves are dried for tea. PARTS USED: Shoots, leaves, unopen flower bud and young pods. The young shoots, up to six inches, make a very passable vegetable to serve like asparagus. The unopened flower buds are eaten like broccoli, the young pods can be cooked like okra. Milkweed is very bitter and this must be removed by boiling water in order to enjoy. Place parts into a pot, cover with boiling water (do not place in cold water first) boil one minute, drain and cover with fresh boiling water and return to heat. Repeat process three times. After vegetable has boiled about ten minutes, season and serve. PARTS USED: The sweet and highly flavored yellow pulp that surrounds the large brown seeds. The fruit tastes and smells tropical and has a smooth yellowish-green skin which turns brown a few days after the fruit is picked. The best paw paws are often gathered from the ground and best eaten when soft and ripe. PARTS USED: Roots. A sweet starchy root that tastes somewhat like a sweet potato. The root is about the size of a carrot and is harvested in late summer or fall. PARTS USED: Leaves and roots. Young edible leaves and plants are gathered in spring. This is one of the first spring wildflowers to see in bloom. The flowers have small pinkish-white petals. The plant is four to five inches tall. Spring tubers grow about three or four inches below the ground and have unusual shapes. They range in size from 1/4 inch to two inches. They are enclosed in a jacket somewhat like our potato. Boil them for 10-15 minutes in salted water. When cool enough to handle, peel off and enjoy. They can be fried, mashed, eaten in salads and cooked with peas like new potatoes. When gathering, take only the large tubers and replant the smaller ones for future growth. PARTS USED: Nut. Gather in late summer or fall. They can be eaten fresh, ground into meal or cooked. Hazelnuts are very tasty and the wild ones seem to have even more flavor than the domesticated European cultivars. PARTS USED: Mature fruits. Gather in August and September when fruits are 1/4 to 1-1/4 inches in diameter and leave a golden stain on your fingers. Cooked fruit mashed into a pulp can be sweetened to make butter. USES: Fruit, bread, pies, candy, jelly, butter. PARTS USED: Fruit. They must be soft and mushy to be good, gather in late fall. Shake the tree to encourage the ripe ones to fall off. PARTS USED: Sunflower seeds, when ripe, make a nutritional and tasty snack; Jerusalem artichoke (Helianthus tuberosa) has fleshy tubers that can be collected in the fall and cooked as one would cook a potato or used raw sliced into salads. PARTS USED: Nuts gathered in October-December. This nut has a very hard husk which is best removed by force. Always wear rubber gloves. The freshly hulled nut will leave a brown stain that is almost impossible to remove. There is no short cut way of shelling them. Use a heavy hammer and a nutpick and the rest of it is just work. The flavor of black walnut combines so well with chocolate that this is the best nut used in fudge. It is also good in cake, cookie, nut-bread or muffin recipes. PARTS USED: Young shoots. Gather nettles April-May when shoots are no more than 6-8 inches tall. Care must be taken in picking the nettles by using gloves and snippers, because this hairy plant causes a stinging sensation when it rubs against exposed ankles, legs or any skin. Cook for a few minutes and add butter. The fibers of this plant are similar to flax or linen and the roots produce a yellow dye. PARTS USED: ripe fruit, pads, buds and flowers (summer). Raw prickly pear pads taste similar to raw okra or cucumber; pads can be prepared by boiling, which loosens the skin, so that it and the prickles can be easily removed, then the soft pulpy interior can be fried for an excellent dish. The flower buds (once despined) can be roasted and cooked in stews. Seeds (gathered in the fall) can be dried then roasted and ground for soup. 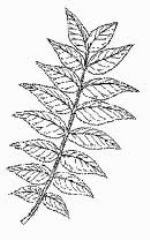 PARTS USED: The leafs have a tart taste, somewhat like lemon, and can be used in salads, to make a fish sauce or brewed fresh for tea. Use sparingly because the leaves have a high oxalic acid content. USES: Fruit, pie, marmalade, drink. PARTS USED: ripe fruit. Size and taste of a lemon . Gather July-Aug. from the ground, fruit has thick flesh that surrounds the many seeds and is particularly sweet. PARTS USED: fruit. Gather ripe fruit midsummer to fall. Use either fresh or dried. Cook in sauces or for jelly. Wild plum is like a tart cherry in shape and taste. PARTS USED: Cherries. Gather in spring. Bitter in taste. Fruits mainly used in jelly especially with apple juice. PARTS USED: Berries collected in summer and fall can be dried and stored through winter. Stir or mash them for several minutes in water. Strain the liquid through cheese cloth several times to remove the fine hairs, and sweeten remaining liquid. The juice from the sumac berries makes a jelly worthy of a meat complement. PARTS USED: Berries, leaves. A sour tart berry that can be eaten when still green. Both stem and whiskers remain on the flowering end of the berry and must be plucked off before using in pies or cobblers. Jelly can also be made from the green berry. The ripe reddish or purple berry does not have the tangy tartness and is preferred by some in the pie. The leaves may be used raw in a tossed salad or slaw. The young dried leaves may be used for making tea. Pick the young leaves and allow three months to dry. USES: Jam, pie syrup, tea. PARTS USED: Berry, leaves. Berry ripens in June. The fruits turn from green to white to red to a purple-black. Best berry for enjoying with cream and sugar or as a topping with your cereal. Superb pie, can be frozen for future use. Leaves dried for tea. PARTS USED: Berries. One of natures richest sources of vitamin C. More than citrus fruits or tomatoes. Can be gathered when ripe in late summer or fall. Used raw, although somewhat bitter, juice often made into jelly or wine. The mildly flavored flowers can be dipped in batter and fried as fritters. PARTS USED: Roots and leaves. The roots pulled from the ground in early spring while ground is still soft is best, smaller roots are preferable. Scrub the roots thoroughly and cut them in pieces. Use them fresh or let them dry for later use. Put roots in a kettle, add a bit more water than you want tea, and boil until it turns a nice red color. Sweeten to taste. The same roots can be used to make tea several times before the flavor is expended. PARTS USED: Shoots, berries. Gather shoots late March through early May. False Solomon’s seal has a flower cluster at the top of the stem. The young shoots look like asparagus and can be eaten as such. Cut off the young shoots, cook for five minutes in boiling water and serve with butter. They can also be used in a casserole. The berries, which are white when unripe, turn a reddish-purple splotched when ripe. The berries may be eaten raw. Eat with other fruit or honey, they aid constipation. PARTS USED: Flowers, leaves and stem. Gather young stems and leaves (spring) and use raw in salads or cooked. Good potherb fixed alone or with other greens, does not need to cook long, just boil in salted water for a few minutes, strain, and serve with butter. Best to gather March-June. The flowers are used raw to garnish salads. PARTS USED: flower, root, branches. The flower is eaten as a green or vegetable while young. The root is edible in september and the branches from the rootstalk are edible raw in a salad. PARTS USED: Leaves, flowers. Leaves and petals of the spring flower may be added to a salad and eaten raw. Leaves thicken soup. Dip petals in stiff egg white, roll in sugar and dry. Some yellow flower species are not recommended for culinary use.